Because I’m bored and taking a break between study sessions today, I thought I’d do a bit of research into the thirteen names of God written a lamen. Since the names of God are held to hold innate power, similar to a mantra in Hinduism and tantric Buddhism, the names of God on a lamen are probably used to charge or guide the power of the spirit the lamen is dedicated to in order to fashion a stronger connection between the conjurer and conjured. For reference, the lamen of Michael, the angel of the Sun is shown below. The original form of the lamen is based on Trithemius’ design in the Art of Drawing Spirits into Crystals. I’ve changed the spelling and format of the names, but they’re essentially the same (I prefer to use the traditional Latin spellings, but also polished the spelling of some of the names that I think got mangled over the centuries). The Hebrew rendering of the names are given where appropriate. EL (אל): “God”, the generic Hebrew term for a deity, but also used for the God of Israel. Very commonly used for epithets of God. ELOHIM (אלהים): A masculine plural form of the singular feminine noun Eloah (see #3), often rendered just as “God” but also “the powers that be”. The plural might be used to denote majesty or refer to the many faces or aspects of the singular God. ELOAH (אלוה): The feminine singular base of Elohim (see #2), again rendered as “God”. It is sometimes used for pagan deities or idols in ancient Israel, and so might be used to refer to God as any holy form or entity. TZABAOTH (צבאות): “Hosts” or “armies”, referring to the heavenly host of God. ELION (עליון): “The supreme” or “the highest”. Note that this does not have the same root as El, since it is spelled with an ayin and not an aleph, though Agrippa spells it with an aleph. ESHEREHIE (אשראהיה): A contraction for the name God gave to Moses on Mount Sinai, “I am that I am” or “I will be that which I will be” (אהיה אשר אהיה, ehyeh asher ehyeh). The name is given by Agrippa as Asher Eheie as a name of God with seven letters. ADONAI (אדני): Hebrew for “my Lord”. IAH (יה): The first two letters of the Tetragrammaton (see #10), also used to mean “God”. Much like how Iod refers to the active principle and element of fire (see #12), the first two letters of the Tetragrammaton are linked to the active and passive principles, or the elements of fire and water, respectively. This hints at God being both male and female, the union of polar opposites. IEHOVAH: A vocalization of the Tetragrammaton (see #10), taking the vowels from the name Adonai (see #7). The vowels originally served as a reminder to the reader to say “Adonai” instead of the Tetragrammaton, but was taken as the actual vocalization in Europe starting in late antiquity. TETRAGRAMMATON: The Greek term for the most holy four letter name of God (יהוה, IHVH), although the Hebrew term for the name is just “the Name” (השם, haShem). It has the meaning of “he exists” or “he who causes to exist”. Although it can be read as “Yahweh”, other vocalizations include “Iaō” (from Greek Ἰαῶ) and Yehowah (see #9). That the lamen uses the word Tetragrammaton which refers to the name but not the name itself implies that it is too holy to be written down even for some uses in the Work, or even that just referring to the name has innate power. SHADDAI (שדי): “The almighty”, “the overpowering”, or even “the destroyer”. Alternatively, it may mean “sufficient” or “enough”, in that God is enough to supply and fulfill all of one’s needs as he is, wills, and does. IOD (יוד): The first letter in the Tetragrammaton, representing the active principle, the element of fire, and the first cause. It is also similar to the word “yad” (יד), or “hand”, referring to the Hand of God. The letter is qabbalistically linked to the world of Atziluth, the realm of pure divinity and the highest of the four realms of the Universe. In the Tarot, especially in the Rider-Waite family of decks, you can see little yod-shaped symbols in cards like the Tower, which also points to the presence and action of God. Agrippa lists this as the sole name of God with a single letter. EHEIEH (אהיה): “I become” or “I am”. Same word as “ehyeh” in Esherehie (see #6). According to tradition, scribes of the Tanakh or any holy scripture in Judaism had to prepare mentally and ritually to write seven of the above names: El, Elohim, Adonai, the Tetragrammaton , Ehyeh Asher Ehyeh, Shaddai, and Tzabaoth. That all of these seven names, plus another six which are epithets or alternate forms, indicates that a lamen of this type is a pretty significant and powerful instrument used in conjuration. I can’t imagine that my orthodox Jewish brother would be too pleased to see me throw around these names like I was preparing for an interview, though. I have enjoyed your posts and look forward to reading more of them soon. 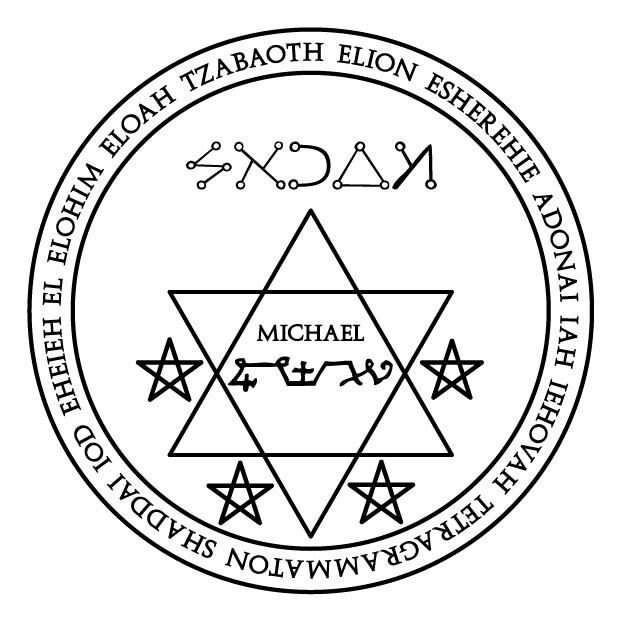 A quick question, where does the sigil for Michael originate? And are there similar ones for the other 3 Archangels? I am constructing an altar for each Archangel and I am looking for all possible combinations of sigils for various sources. I’m personally unsure how far back the seals for the planetary angels go. I’ve seen similar ones in the Heptameron of Pietro d’Abano as well as the Munich Manual of Necromancy, and the earliest variant of them I know of (if my attributions here are correct, but don’t trust me on this one) comes from the Sefer Raziel. You can find the other lamens and the seals for the planetary angels under the Crafts/Designs menu above on my blog. You’d also do well to investigate old grimoires, starting perhaps with the website Esoteric Archives. Also, the seal above is for Michael, yes, but specifically the planetary angelic governor Michael (of the Sun), whom I treat as a different entity than the archangelic king Michael (of East/Fire). They may be the same entity but with a different office/aspect, or they might be different entities entirely; the effect is the same, where they’re basically different spirits with different voices and looks. There are seals for the seven planetary angels, but no such seals exist for the four archangels; I have my own set I obtained from talking with the angels directly. Add to it, the fourth archangel Auriel doesn’t even exist according to the Catholic Church (but do they really matter?) though he has a wide following, so it’s up to you. This is very important, that information on the power of a G-d revealed codified information to his people.